A side event in conjuction with Phobiaklik's 'Graff And Unite' grafitti event. oraganised by the District shop. 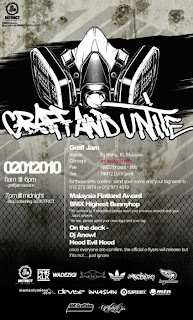 the phobiaklik grafitti crew is throwing a cool grafitti event in Kuala Lumpur this weekend. 'MFA 2009' , that is the award for the overall no.1 BMX flatland rider in Malaysia for the year 2009.
this is the event all BMX riders in Malaysia had been waiting for, that is to honour the best rider in Malaysia through 'Malaysian BMX flatland top ranking 2009' programme started early this year. 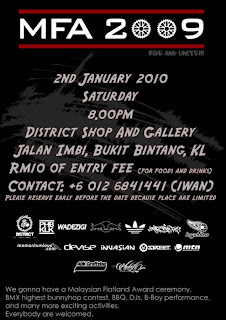 Malaysian Flatland Award 2009 in conjunction with Ride and Unite!!! This entry was posted in bmx flatland. Bookmark the permalink.